Mizuma Art Gallery is delighted to present a body of new artworks by TENMYOUYA Hisashi at his solo exhibition “FURYU-EXTRAVAGANT”. Born in 1966 in Tokyo and after working as an art director at record label, Tenmyouya started his career as a contemporary artist. He calls his own works “Neo Nihonga (Neo Japanese painting)” and established a unique genre, “Butoha”, the school that fights with a paintbrush. His works are included in various exhibitions in Japan and the abroad, and also he contributed artworks for a serial novel in Nikkei-Shinbun (Japan Economic Times) in 2007-8 and created the FIFA 2006 Official Art Poster. Tenmyouya, who pursues his unique aesthetic values with the Japanese spirit with Western learning by combining the influence of HIP HOP he had as a youth, and traditional Japanese style of art, seems more into authentic Japanese beauty. Calm and simple Wabi and Sabi and, in recent years, pop Anime and Manga are popular words to describe Japanese can be mentioned first but Tenmyouya has been consistently focused on Basara and Kabukimono that values great-flamboyant decoration. It has great influence on today’s Japanese sense of beauty. Having inherited such spirits, he began to present “Otokodate declaration” in 2009. Warriors he paints for this show carry elaborated tattoos, because the artist sees tattoos as symbols of the Otokodate spirit. Tattoos are often regarded as antisocial motifs, however theywere also decoration and identification of class and used for religious purposes. Their long history in Japan began as far back as the Jomon era (14,000 BCE to400 BCE). And then after the year of twists and turns, with the elements of Ukiyoe and the technical progress, it became as we know today. Decorative tattoos are distinguished from tattoos for punishment and were popular among dashing men and edgy merchants. The exhibition title “Furyu” is different from “Fu-ryu”, a word to describe “elegance”. “Furyu” signifies an extravagant and elaborate design made to astonish people. As well as Basara and Kabukimono, it is an aesthetic value contrary to Wabi-Sabi. 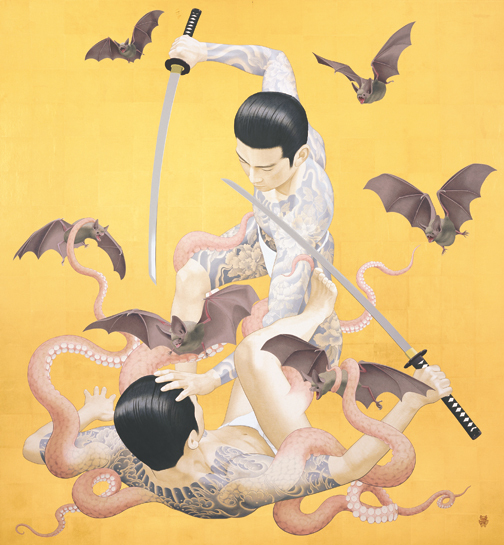 In the main piece of the show “Intertwining Thoughts”, embodied thoughts of two fighting men expressed as a form of bat and octopus tangling as if they enjoy fighting. And Furyu ornaments are found around the painting. Also five paintings inspired by MIYAMOTO Musashi’s “The Book of Five Rings” are exhibited. Tenmyouya’s sharp inspiration and tradition is mixed well and the elaborated tattoos that cannot be realized on real human skin also attract eyes of viewers. Tenmyouya, who sets up new value with unique perception, seems to let us look towards other side of beauty that was not mentioned in long history of Japanese culture. Also he might attempt to present the unique background around tattoos and inherited knowledge and techniques to the contemporary world. * A word often used to describe the act of daimyo (feudal lord) during the Nanbeichao unquiet days. Its etymology of Buddhist terminology “Vajra” in Sanscrit means diamond. Its ability to shatter everything turned its meaning to off pitch music and dance, and further extension to act every extravagant way. ** A word used to describe a person who has a desire not to remain within secure constraint of the orthodox but to seek change. It derives from a word “kabuku”, to behave as one pleases or wear blatant out fit ” (Kojien) is also etymology of the traditional Japanese theater “Kabuki”. *** Aesthetic value in Edo period and related to Basara. Also the spirit and style of men who are side with the weak and crush the strong to keep their face straight and do not fear the death for it.